Algorithmic statistics has two different (and almost orthogonal) motivations. From the philosophical point of view, it tries to formalize how the statistics works and why some statistical models are better than others. After this notion of a “good model” is introduced, a natural question arises: it is possible that for some piece of data there is no good model? If yes, how often these bad (non-stochastic) data appear “in real life”? Another, more technical motivation comes from algorithmic information theory. In this theory a notion of complexity of a finite object (=amount of information in this object) is introduced; it assigns to every object some number, called its algorithmic complexity (or Kolmogorov complexity). Algorithmic statistic provides a more fine-grained classification: for each finite object some curve is defined that characterizes its behavior. It turns out that several different definitions give (approximately) the same curve. Road-map: Sect. 2 considers the notion of \((\alpha ,\beta )\)-stochasticity; Sect. 3 considers two-part descriptions and the so-called “minimal description length principle”; Sect. 4 gives one more approach: we consider the list of objects of bounded complexity and measure how far some object is from the end of the list, getting some natural class of “standard descriptions” as a by-product; finally, Sect. 5 establishes a connection between these notions and resource-bounded complexity. The rest of the paper deals with an attempts to make theory close to practice by considering restricted classes of descriptions (Sect. 6) and strong models (Sect. 7). In this survey we try to provide an exposition of the main results in the field (including full proofs for the most important ones), as well as some historical comments. 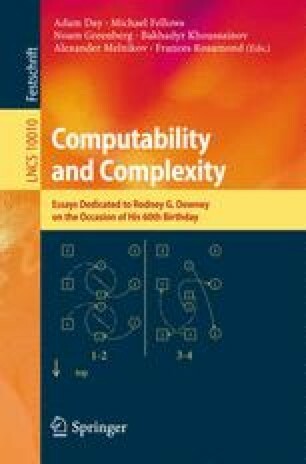 We assume that the reader is familiar with the main notions of algorithmic information (Kolmogorov complexity) theory. An exposition can be found in [42, Chaps. 1, 3, 4] or [22, Chaps. 2, 3], see also the survey . A short survey of main results of algorithmic statistics was given in  (without proofs); see also the last chapter of the book . The work was in part funded by RFBR according to the research project grant 16-01-00362-a (N.V.) and by RaCAF ANR-15-CE40-0016-01 grant (A.S.). We are grateful to several people who contributed and/or carefully read preliminary versions of this survey, in particular, to B. Bauwens, P. Gács, A. Milovanov, G. Novikov, A. Romashchenko, P. Vitányi, and to all participants of Kolmogorov seminar in Moscow State University and ESCAPE group in LIRMM. We are also grateful to an anonymous referee for correcting several mistakes.